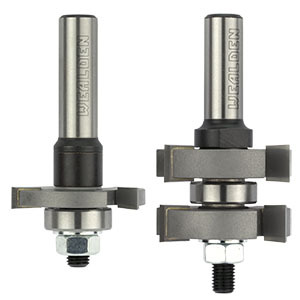 This pair of cutters has been specially designed to enable the rapid and accurate production of frame joints for all types of panel construction. They may be used to produce doors, chests and furniture and, in fact, any form of construction that requires grooves for panels. Three groove widths are available, 6, 7 & 8mm, to allow the use of various thickness panel materials. Spare shims are provided with each set to allow the fit of the tongue in the groove to be adjusted. These are large cutters and the tongue cutter in particular will benefit from being run at a reduced speed. All components are also available as spare parts and alternative width groovers may be purchased to suit different thickness boards. When purchasing an additional groover, a set of shims may also be required to adjust the width of the tongue. Longer arbors are available to suit some router/table combinations (see replacement parts list below). These will increase the "D" dimension to 58mm. PLEASE NOTE: These cutters are sold as a pair (one tongue assembly and one groove assembly) and are only available in 1/2" shank. 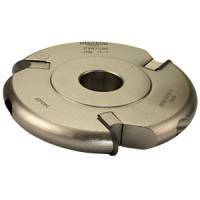 The groovers and other parts are not interchangeable with our 1/4" bore diameter groover range. Three sets are available with groove widths are of 6, 7 & 8mm, to allow the use of various thickness panel materials. The 7mm size should be suitable for veneered MDF board, however it would be prudent to check the thickness of the board, which varies considerably, before selecting the cutter width. Spare shims are provided with each set to allow the fit of the tongue in the groove to be adjusted. These are large cutters and the tongue cutter in particular will benefit from being run at a reduced speed. All components are also available as spare parts and alternative width groovers of 6.35mm and 9mm may be purchased to suit different thickness boards. When purchasing an additional groover, a set of shims may also be required to adjust the width of the tongue. Longer arbors are available to suit some router/table combinations (see replacement parts list above). These will increase the D dimension to 58mm.